As you might have noticed, finishing up the 1620s stays, and a bum roll on top, has completely knocked me off the blogging train this week. So here is a catch-up post filling out several CoBloWriMo prompts (namely Small Project, Made For Myself, Event, Favourite Resource, and Media) and telling you about the straw bonnet I made for the current Historical Sew Monthly challenge. But, one after the other, before anyone gets dizzy. First off, the “event” I made it for is the prospective photoshoot I told you about last month. In my area there are few costume groups I know and big reenactment events are few and far between. So I cannot usually attend them without traveling quite some distances. But, on the plus side, there is a lot of scenery around, such as a baroque city center nearby and a few pictorial hunting lodges. For my birthday last month, we went to Schwerin, which has a beautiful castle and park with a Georgian colonnade and all . It would have been perfect for photos. Then the weather made photos impossible with stints of pouring rain, followed by singeing sun. And traipsing in the mud would have ruined the gown…. Oh well, maybe next time. 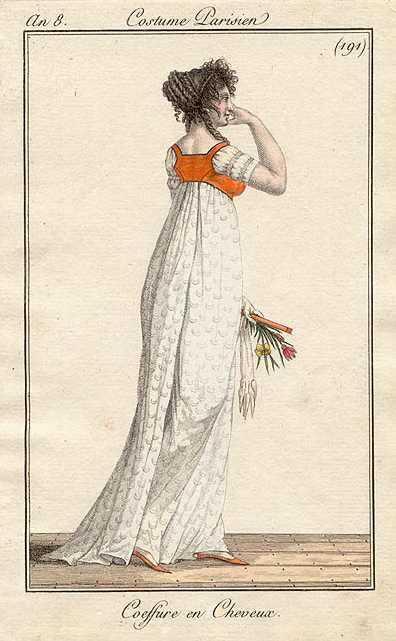 The design for the bonnet was inspired by this French fashion plate from 1810. Especially by the second last one on the far left and a bit by the first on the far right side. Fashion plate of different bonnets, caps and toques from Costume Parisien (c. 1810). This brings us to the “Media” and “Rescource” section of this post. ;) I have to say that I loove Regency-era journals and magazines such as “Ackermann’s Repository” or “La Belle Assemblée”. Mostly, for the many fashion plates but also for the other period contents, such as letters to editors, etiquette or fashion advisors, short stories, poems and musical notes. Since I got to work with extant issues of Ackermann’s Repository in person, I am more or less enchanted. I even own a Franco-German volume of “Journal des Dames”, which was a total chance find. Sadly it has no fashion plates, only the French descriptions, with German translations on every other page. My pride, a French-German volume of “Journal des Dames et des Modes” (c.1828). The Library of Congress, mostly for copies of Ackermann’s Repository, but also some fashion books. Gallica for French journals, mainly Journal des Dames. A look at the ribbon tie, wrapped under and over the crown. I finished everything in the course of one evening, with my father looking on. When he was little, his mother befriended a professional milliner, so he has always been excited about hats and hat-making; although trimming this bonnet was nothing much to look at. The Challenge: #8 – Ridiculous. Some of the headgear worn in the Regency era looks a bit ridiculous to the modern eye but was very stylish in the period. To make my bonnet less boring, I placed the flowers in a rather unusual way. Materials: A pre-made straw bonnet I bought at Nehelenia Patterns some years ago; fabric flowers; satin ribbon. Pattern: Based on an 1810 fashion plate. Time to complete: Roundabout 4 hours. How historically accurate is it? Somewhat accurate. The maker shaped the bonnet based on period templates. But the trimmings are made of modern materials. First worn: Not yet. It was meant for a photoshoot, but the weather did not play along. Total cost: About € 30 for the bonnet and € 4 for the trimmings. Today’s post should be about something we made for someone else. Since I very rarely do commissions and have already posted about the cap I made for a friend, I will tell you about the beautiful accessory a friend has made for me. For ages I had been looking at the pineapple reticule from the Kyoto Fashion Institute, wondering if I could make my own. Being a relatively new knitter, I have not yet mastered knitting in the round. So this goal has remained unattainable up until now. Yellow silk gown and knitted silk pineapple reticule (Kyoto Fashion Institute, c. 1800). Last Christmas, however, the wait had an end: A very dear friend sent me one! Her mother had knitted it. She is a super experienced knitter, always looking for the next challenge. For it, she used this pattern, finishing it in record time. I will be eternally grateful to her for this incredible gift! Here it is. I have yet to show it off in a photoshoot to do it proper justice. 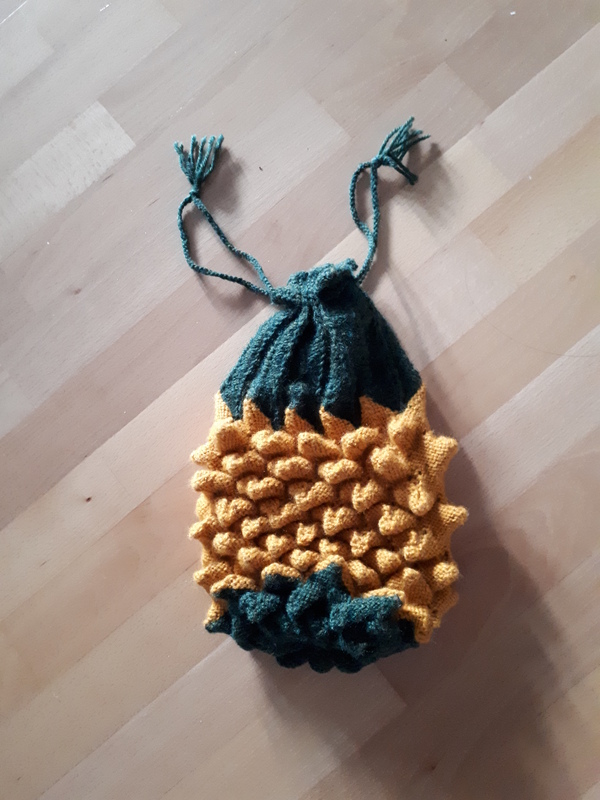 My pineapple reticule, knitted in cotton. So today I have picked a little gem that seems to go overlooked a lot. It is an extant book I stumbled across in an online library. Archives like these, especially Gallica and the Library of Congress, are my guilty pleasure. Sometimes I spend whole evenings there, just going on treasure hunts. This is how I found the “Manuel des dames” by Mademoiselle Clenart. As the title suggests, it is written in French and no, there are no drawings in it. For a not-so-advanced French speaker like myself this can make reading the book a bit tricky and even some native speakers get puzzled with some of the expressions used by the author. But still, this book is great. The second edition found online dates to 1833, but it is a re-print of an edition published at least 10 to 15 years earlier. So it is sort of a “style guide” for the savvy late-Empire lady. It has everything from potion, powder and soap recipes to washing directions for period fabrics as well as advice on etiquette and fashionable dress. I especially love the corsetry chapter, which offers advice on different corsets, stays and belts for every occasion. This includes a section on maternity stays and directions to add fan-lacing to a pair of stays. I used the advice when making my morning belt last year. Despite the “language barrier”, I recommend this book to everyone interested in early 19th-century costume or just curious about reading extant sources. You can download a PDF of this book here on Gallica. Enjoy! Yesterday was spent boning the 1620s stays. And, yay, they are officially boned now! Photos will follow. So tonight is spent catching up on the CoBloWriMo fun I have missed. The prompts for the past two days have been to blog about our favorite era and to tell the story of how we got into costuming / costume blogging. First of, I have been a part of the costuming world for about five years now, and it is one of the best journeys on which I have ever been. Before that, I was just very interested in costumes, both historical and ethnic. In my teens I sketched a lot of costumes to accompany fanfiction and other stories I wrote. Some time ago I ran across a folder with in a drawer with some of those sketches still inside. I had forgotten I had done most of them in ball pen… oh my goodness *chuckle*. With the costume journey my sewing journey began as well. I had not sewn much, aside from the usual mending, before starting my first costume, an 1850ish wrapper. It took ages to finish and I learned the skills I needed off Youtube tutorials. Up to that point, my relationship with crafting and needleworks had been very complicated. On the one hand I come from a family of talented knitters, cross-stitchers and sewers. My grandmother, for one, was a tiny lady who had to make and alter most of her own clothes. She was already old when I was born and we only spent the first ten years of my life knowing each other. But I remember going out with her one fall, to collect chestnuts. It felt like going on a promenade with the perfect 1930s lady in a tailored wool coat, feathered fedora and fur stole. This was when I decided I want to be such a lady one day, too. On the other hand, any crafting endeavor since nursery school had been connected with frustration and self-doubt. The main reason for this were teachers and educators who had no patience for the clumsier kids like me. As a result, I have been told “you can’t do it!” more often than I can count. And it stuck, until well into my teens. Eventually I stopped caring what people thought of me or my skills and just started trying out crafts at my own pace. I found a mentor in my high-school art teacher and majored in Art although everyone but the two of us thought I would fail graduation if I did. Although in the end it was my best subject and I learned to use my creativity as well as my hands. After falling back in love with embroidery around the age of 16, it took another six years for sewing and costuming to come around. I had had a friend in the SCA before that but never believed there were more people like her who sewed actual, historically accurate clothes. Then I started googling, found The Dreamstress, Fashion Through History *waves at Åsa* and the Historical Sew Monthly. After that the list of fascinating historical costume blogs to read grew and grew. I was hooked and decided to give it a try. Everything started in the same year as my study abroad term in Vienna. By the time I got there I had finished the wrapper and a sort-of Regency day dress. I was yet undecided if I should fully dive into the hobby or which period to sew. Then I found something interesting. By the time Wien Museum (a comprehensive museum of Vienna’s city history) still ran an open fashion library at Palais Hetzendorf. My first visit there was just amazing. It took care of any further questions. I came in, asked the librarian about extant journals and she inquired which time period she should get me. Totally clueless, I asked back which was the earliest they handed out to visitors. A moment later I had issues of Ackermann’s Repository from 1800 on my study table. Ever since, Regency has been my main and favorite era. This shawl dress from Wiener Moden Zeitung has been my dream gown ever since. Promenade dress from Wiener Moden-Zeitung (c. 1816). Corinthian dress from Wiener Moden-Zeitung (c.1810-20). There is another funny story about my relation to the French Empire era. I only learned about it from my mother some two years ago. It is this: My middle name is Désirée. It is a bit peculiar seeing how my parents have never been to France, let alone speak a word of French. So I asked why. It turns out, I have been named after Désirée Clary Bernadotte through a series of crazy coincidences. The first is that my father loved novels on the age of Napoleon and had his mind set on naming a daughter after Désirée. She had given Napoleon a run for his money and he admired her for it. Secondly, there was once a Swedish ferry called “Princesse Désirée”, named after a direct ancestor of hers. My mother saw it as a little girl and chose to name her daughter Désirée, too. If that is not peculiar, I do not know what is. Thus, Désirée and her times will always play a special role in my (sewing) life. Désirée Clary by Francois Gérard (1810). And this has been my entry for the past two prompts. I hope it has not been too lengthy to read. Tomorrow I will try to be good again and return to the a post a day routine. After fixing some image server issues, the blog is back and I can finally tell you about all the projects I have finished over the past few months. Since my last post, the white crossover gown has come together at last. But I will keep you in suspense a little longer, since a photo shoot opportunity (my first proper photo op, yay!) might arise at the end of this month. So, today I want to tell you about a gift for my dear friend Ann. She was kind enough to go through her stash and send me fabric for my shortgown when I could not find anything suitable on this side of the pond. This is why I simply had to sew something for her in return. Because she had once told me that she does not have a simple linen cap for reenactment, I knew just what to make for her. For the cap I used my favourite Mill Farm pattern, the same I have used for mine here, and leftover white linen fabric from the bed shift. When making it up, I tried my hand on two period sewing techniques. The first were itty bitty rolled hems around the brim, on the back crown, and the ties. …. and on the tape ties. Finishing the row of whipped gathers on the crown. The gathered crown (with a rolled hem at the bottom). The attached whipped gathers, inside view. The attached whipped gathers, outside view. The finished cap… back view. Speaking of gifts: There has been another, very exciting, surprise that reached me in the mail earlier this year. But I will leave it for next time, since it really deserves a post of its own. It seems the promise to bring you up to speed with this year’s costume plans “soon” now translates into “come April”. Oops! This is what happens when you get caught between job hunting and moving house… The latter has just been accomplished successfully. So now the update on my historical sewing plans for 2017 can finally go ahead. The 1920s endeavor has already been underway since December. So far, I have finished four pieces for a basic 1920s evening wardrobe. With the evening mantle I made for the Historical Sew Monthly’s March challenge, all that is still missing for now is a matching bra. The plan is to get cracking on it at some point later this year. The pattern for it will come from a 1925 French fashion magazine. And, of course, I will show you the other finished items in a series of catch-up posts! Brassiere pattern from “La Mode du jour” (1925). Click image for a PDF pattern! Woman’s linen smock, Museum of London (c. 1600-18). The plan to make an overdress came together the moment I saw this gorgeous violet gown at Rüstkammer Dresden. Is it not absolutely lovely? Violet silk overdress, German, Rüstkammer Dresden (c. 1630-35). Young lady with a plumed headdress, Artist unknown, Manchester City Galleries (c. 1633). Portrait of Saskia van Uylenburg by Rembrandt (c. 1633-34), Gemäldegalerie Kassel. Sprigged cotton dress, American, Metropolitan Museum (c. 1800-05). For it I am using the Laughing Moon #130 wrapping front gown pattern. As a sleeve option I am favoring elbow-length sleeves. They are simply the best sleeve option if you ask me. Who agrees? Laughing Moon Mercantile pattern #130. Cotton bodice, American, Metropolitan Museum (early 19th century). But I want mine to add a splotch of color to the outfit, like the orange example in the fashion plate below. Also have a look at the lady’s wacky “bonnet” hairdo. I have a scrap of leftover IKEA reproduction cotton set aside for my bodice. The floral pattern should be really fun to work with. I am so excited to see how it will turn out! 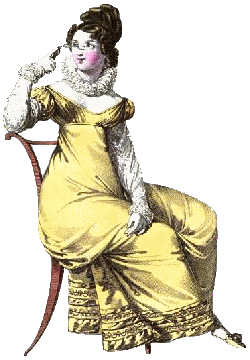 Fashion plate from Costume Parisien (c.1800). For now it is back to the sewing table with me. At the moment, the smock and Regency gown are pulling straws to see which one will be made up first. ;) I will keep you posted on the outcome. Thank you for your ongoing patience with me and the blog! Last autumn, I made a new cloak to accompany me to one of my first historical outings, a reenactor’s market. It took place in early October, so my blue wool cloak was too warm and my new linen spencer was a bit too airy. So I went out hunting for a medium-weight, cozy fabric and found just the thing on sale: a dark red felted cotton. It is not really a felt but has a soft, woolly surface texture that leans more towards flannel. Hard to describe, really. I am still no entirely sure whether it would have been used in period, but the color persuaded me to go for it. All in all, the pattern is not very complicated. The body is a semi-circle with a radius of 150 cm. Being a bit short, my semi-circle has a radius of 130 cm, minus 12 cm for a round neck-opening. I drew the circle directly on the fabric. To make drawing and cutting easier, I took a 260 cm long and 130 cm wide fabric piece and folded it lengthwise before I started. Here is the finished body on the dress form. Afterwards I made up a hood with a self-fabric lining. Then I simply gathered the neckline and sandwiched it between those two layers. Lengths and lengths of hand-ruffled trim. The finished product ties with 2.5 cm seam tape in a matching shade of red. It is all rather plain now, but a real joy to wear. It coordinated well with my working-class costume and kept me warm all day. Some of the people I met on the road to the event took an interest and started telling me about their friends or family who also wear cloaks at LARP events. I was not really prepared for this. So I told them some more about my costume and fashion in the early Regency era in general. Most were a little surprised that cloaks had still been a thing in the 19th century. In today’s post, I will share the research and drafting / making process with you, so you can go on and make your own morning belt. The research has proven a little tricky, since extant examples of Regency-era morning belts are scarce, or at least somewhat hard to identify. But more on that in a moment! Since only very little information on the wearers and the occasion of wear exists, we can only assume that they have been used for morning / undress or maternity wear. And it seems very likely. Still, I have always missed a clear link between these examples and the ominous “morning belt” from period texts. So I did a little digging. On a whim, I started searching in French. This way I stumbled into a period book I had not know before the “Manuel des dames” by Madame Clenart, whose real name was Élisabeth-Félicie Bayle-Mouillart. You can access the full text here at Gallica. This is a second edition from 1833, but the content seems to date back to at least the early 1820, so it is a great resource for the mid to late Regency era. And it really is pure gold, it does no only hold advice on corsetry, fashion and manners but recipes for cosmetics, perfumes and some laundry directions for dress fabrics, among other things. Extract from “Manuel des Dames” (2nd edition, c.1833). Half-stays for the morning are about 8 to 10 inches high (I understood this to be the back length), corded or lightly boned. The top part is shaped like it would be in a regular pair of stays, but the back ends in two long tabs that tie at the front with thread ribbon. They are very convenient for dressing in the morning, plan on going on a bath later or when you are in a hurry to get dressed. I do not know about you, but this sounds perfect to me on an average morning! Fabric suggestion include white cotton or coutil for summer and nankeen or grey cotton canvas for winter wear. A lining in a matching colour is also suggested to make the morning belt more durable. From this I gathered that morning belts also featured the crossover back tabs seen in the half stays above. Although they do not quite resemble those in the Galliera example, but come very close to those of the Utrecht stays. Half-boned stays (Centraal Museum, c.1820). Bust bodice ( V&A, c. 1820-29). After gathering this information, I finally felt confident to delve right into drafting my morning belt. I started by following the instructions given for the front and back / side back pieces. The only thing I did differently was to use a slightly longer back length (9″ instead of the given 8″). For the bust gussets I cheated and used my size gusset from the Laughing Moon #115 pattern. I left out the straps and included them in the back piece later on. To create the crossover back tabs, I turned to the pattern for the Utrecht stays by Sabine as a rough guide. First, I created the overlapping section at the center back. For this I drew two lines. The first was a straight extension of they stays’ bottom (underbust) line. Its length was equal to about 1/8 of my underbust measurement. I redrew this line later. Then I connected the end point to the top end of the CB line with a diagonal. The rotated back pattern piece. Now I elongated the vertical line by the length of my side back piece (again 1/8 underbust) plus two or so extra inches that would got over to the front at the sides. At the bottom edge of the line, I drew a perpendicular that was 2 1/2″ long. This marks the later front width of the tabs. Now I went back to the original bottom edge of the CB line from the initial draft. and connected it to the end point of the short perpendicular line with a long curve. For the strap, I did a similar thing. I extended the top of the long vertical line by the desired strap length (14″ in my case). Again, there is a perpendicular line at the top edge, 2 1/2″ long. From its end point, I drew another line, parallel to the vertical. To get the length of the line I calculated my strap length – shoulder to underbust length at CB. This way I made sure that only a narrow strap shows at the front. The finished back and strap pieces. When making morning belt, I used up the leftovers from my long stays. Thus I made them out of two layers, an outer layer of white cotton twill and a sateen lining. After putting in the gussets and sewing together the individual layers, I joined them together by stitching through the side and side back seams. This minimized the amount of basting at this stage and made for nice, extra durable seams on the finished corset. Joining the layers together by stitching through the side seams. After adding four hand-bound eyelets to tie the straps to the front, I started binding the morning belt with cotton bias tape. I bound the short edges of the bottom tabs individually then sandwiched the twill ribbon that ties at the front in between. Then I went about the remaining binding as usual. The top binding at the front holds a small 1/2″ drawstring that keeps the ladies in check. On the dress form, the finished morning belt looks like this. It fits much better on my ( somewhat more squishy) self and I really love how it came out. Close-up of the strap lacing and side boning. Cording at the side back seam. Now I am so happy that I finally got to make this piece of Regency corsetry for modern ladies in a rush to get dressed! :D I hope you enjoyed this rather long post and it has shed some light on the making of a morning belt. If you have questions, please feel free to ask them here at any time. Wishing you all a lovely rest of the week! Following the old saying “out with the old in with the new” I will start the new year with a long overdue catch-up post. It will be one in a series, since there are still some pretty things from last year I would love to share with you. And with the new Historical Sew Monthly challenges and a heap of fresh sewing ideas, there are new projects awaiting as well. Today I am going to provide you with some long overdue picture “spam” of the late 18th/early 19th century linen cap I made to go with my short gown. It is really simple but I love it to bits and wear it the most of all my Regency-era caps. For it I used view 3 (bottom left) from the Mill Farm late 18th-century caps pattern, with a few changes to the original make-up. Mill Farm 18th-century caps pattern. The changes I made were really few, based on personal taste. For once, I cut out two brim pieces and sandwiched the crown and trim between them. Here the pattern called for a single, hemmed brim to which the hemmed crown and ruffle are attached with whipped gathers. This is the more historically accurate approach for the late 18th century. Since I was not so happy with my whipped gathering skills and was using an itty bitty bobbin lace trim, I opted for the “sandwich” method instead. The crown with the finished drawstring casing. The finished linen cap, side view. The finished cap, top view. The finished cap, front view. And that was it already. I cannot say often enough how happy this simple little project made me, since I completed it mid-thesis when I needed something pretty to distract myself from the work. Now the thesis is finally, finally handed in and I am looking forward to creating new, lovely items for my historical wardrobe. Once I have fudged out what to make for this year’s HSM challenges, I will share my plans with you. If all works out, I am going to spend some time sewing outside my Regency comfort zone, trying out some new fashion eras. Some of you have already spotted my 1920s robe de style on the Facebook page. It has been my first venture into a different century. I will keep you posted on the other projects to come.